An example of a police alert on the Waze app. Image courtesy of Waze. In a letter sent to Google last weekend, the New York Police Department threatened legal action if the technology company ignored demands to remove a feature on its Waze app that allows users to post locations of police checkpoints. The New York Post said the cease-and-desist letter could also apply to Waze’s “speed cam” function, which allows people to alert other drivers about speed traps and red-light cameras in their area. 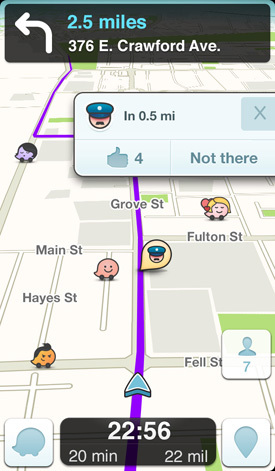 Waze was acquired by Google in 2013. Its “police” feature first faced scrutiny in 2015 from New York’s Sergeants’ Benevolent Association and the National Sheriffs’ Association, which said it could put police officers’ lives in danger, the New York Post said.